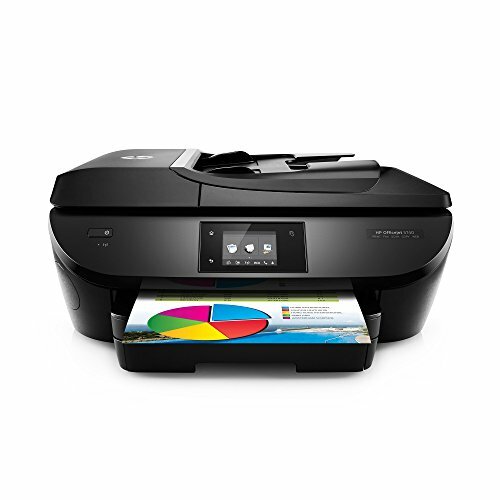 HP OfficeJet 5740 Wireless All-in-One Photo Printer with Mobile Printing, Instant Ink ready (B9S76A#B1H)This HP Printer has been professionally refurbished and tested by a Certified Technician. We make every effort to clean and restore the printer so you have a great experience with it. This product may have minor cosmetic issues like light scuffs or scratches and this should not hinder the performance of your device.SpecsPrint, copy, scan, fax, photo, wirelessPrint speed ISO: Up to 12 ppm (black), up to 8 ppm (color)Scan to email; Auto duplex printing; 25-sheet ADF; Borderless printing; photo trayHigh yield ink available; Instant Ink eligibleIncludesPower CableSoftware CDInk Cartridges90 Day Limited WarrantyThis product is covered by a minimum 90 day repair/replacement warranty. Specific warranty information and how to submit a warranty claim is included with your product. Easily print documents and photos from all your mobile devices whether at home, work or on-the-go. Wired and wireless network connectivity and NFC touch-to-print let you stay connected to your mobile devices and internet-connected notebook. Speed through home and work tasks with this sleek, sophisticated HP Officejet e-all-in-one that supports the needs of your busy family. Create stunning, lab-quality photos and laser-quality documents with ease. 90 Day limited warranty included.